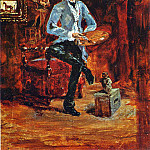 An aristocrat by birth, he could shine at balls and social receptions. 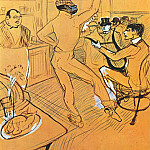 But fate made him a brilliant singer Paris bottom. 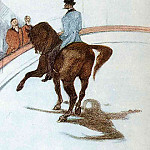 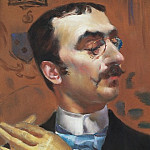 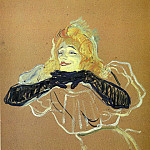 Count Henri Marie Raymond de Toulouse-Lautrec MONF - that's how it sounded. 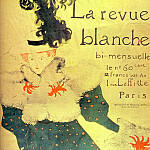 The baby was born on November 24, 1864 in the town of Albi in southwestern France. 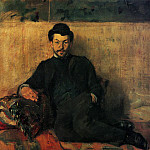 His parents were first cousins, the heirs of an old aristocratic family. 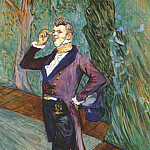 When Henry was born, his father mentally trying on the role of heir to the handsome rake, wins the heart of the French noblewomen. 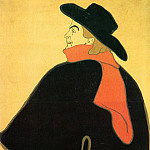 Himself Count Alphonse was a typical tyrant. 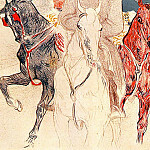 He loved hunting and horses, famous for eccentric actions (once for dinner in the parent castle he went dressed as a dancer). 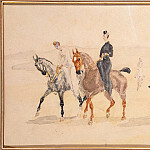 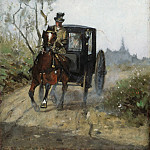 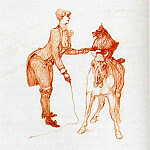 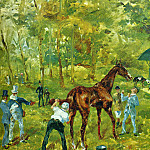 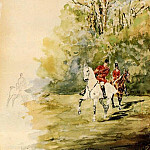 Earl and his brother were talented amateur artist, painted their horses and hunting facilities. 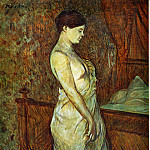 And yet ... Alphonse loved to change his wife. 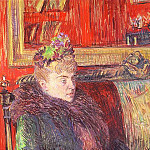 But the Countess Adele by nature was a woman of gentle disposition, she doted on her only son (the second she lost her 4-year-old). 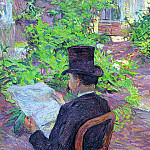 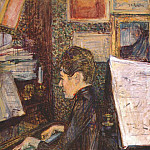 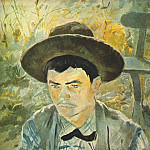 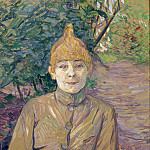 Henri was a sickly boy, but very cheerful, well-studied, brilliantly painted. 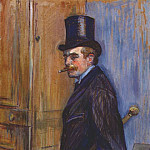 The parents separated after the death of his youngest son, and Henry lived on the estate, each in turn. 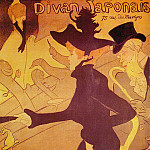 "This is the will of God"
... Or Diex lo volt in old French - the motto on the coat of arms of the Count of Toulouse. 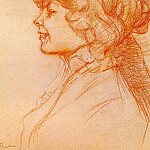 Well, according to the will of God or because of a genetic defect (mother's sister - dwarf, parents - in incestuous marriage), or maybe because of weak bones, but in 13 years, Henry fell and broke her hip of one leg, and a year later the same thing happened, but this time with the other leg. 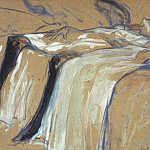 The bones fused bad, and the boy continued to grow only in the upper part of the body. 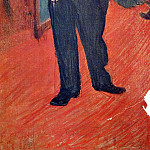 Big Boy, he had 18 years' growth of 1 m 50 cm, developed torso and head, but his legs dwarf. 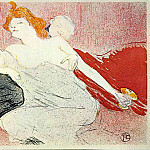 Loving mother worried about his son, his father was angry that his dream of a bright future successor will not come true. 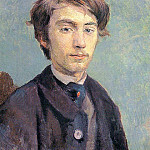 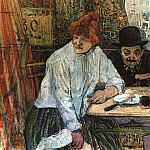 And even more so Alphonse was not happy when a child who loved drawing Henri appeared as a young artist in Montmartre - this cesspool of Paris of the late XIX century, working-class suburb, among thieves, prostitutes and other uneducated trash. 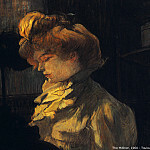 So, in 1884 Lautrec 20 years old and he is learning to paint in the famous Atelier Fernand Cormon, a painter of the academic direction (drawing on religious and historical topics and portraits). 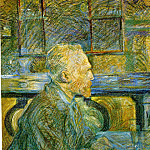 But it gives students the freedom to explore making a technical minimum. 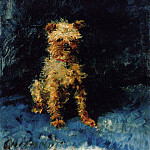 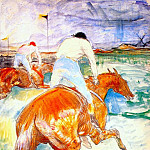 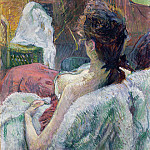 And next gaining strength Impressionists: Degas, Renoir, Pissarro, Monet, Cezanne. 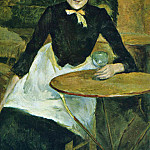 The poet Baudelaire calls for artists to paint life around them, and the artist Courbet said that art should be "smeared with dirt in it." 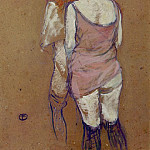 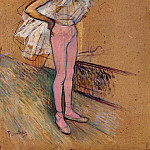 The desire to violate the canons of bypasses and Lautrec. 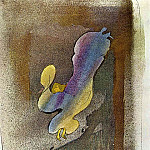 He is trying, by his own admission, "write realistic, but not perfect ... Let there be a defect. 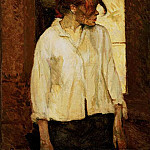 I do not sympathize with the shortcomings, I like to embellish them. 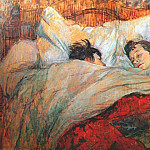 Let them be bigger and brighter than the reality. " 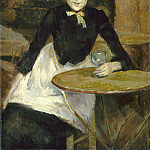 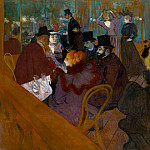 In Montmartre cafe "Black Cat" and "dead rats" in the 1880s sit alongside classics of the Atelier Cormon and the avant-garde of all sorts, including the Impressionists. 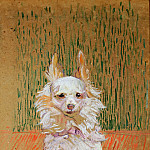 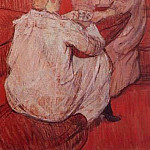 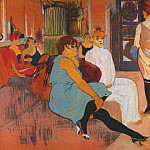 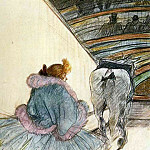 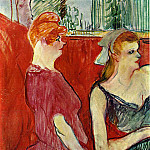 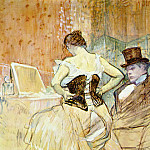 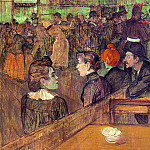 Toulouse-Lautrec admires Degas and Renoir, trying to learn from them in absentia. 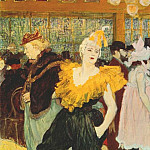 Henry builds on Renoir "Ball at the Moulin de la Galette" and making sketches in the ballroom "La Galette" in the new set up their style: breaking the rules and gipertrofiruya flaws. 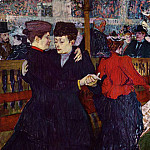 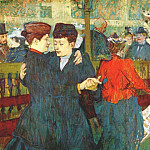 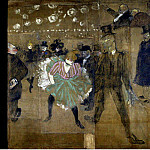 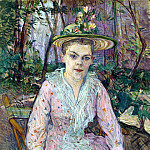 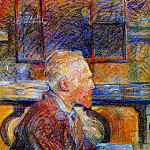 Graphic publishes the popular French newspaper, and art dealer Theo van Gogh wrote to his brother about what he had seen at the Salon of 1889 a very strong picture Lautrec, especially good "Ball at the Moulin de la Galette." 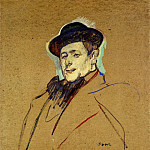 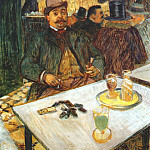 He was the first vendor Lautrec paintings. 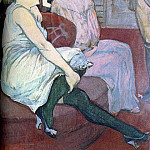 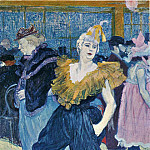 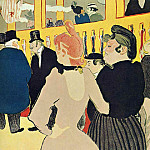 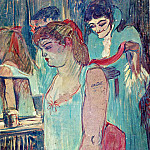 Already since 1888, the work of Henri began to sell well, and when it opened in Montmartre cabaret "Moulin Rouge", a painting from the Circus cycle Lautrec decorated the main hall at the entrance. 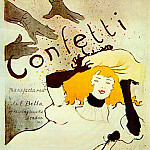 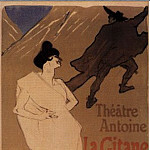 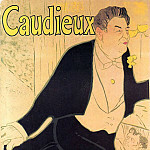 After 3 years, the owners have turned to Lautrec for a poster for the cabaret. 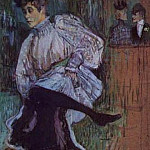 The star of "Moulin Rouge" was the famous Louise Weber, known as La Goulue, a former laundress and a prostitute, known for his energetic cancan. 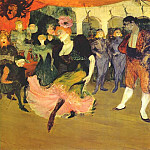 She threw men hats, throwing up his feet during the dance. 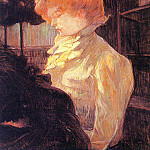 Lautrec it once already painted, and that her "starring" he decided to make a poster to advertise the theater. 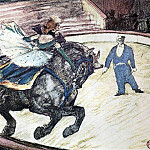 The picture size of 1 x 2 m showed Gulya La at the time when it threw the leg upwards. 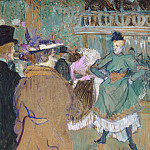 It was a little exaggerated: the heroine of the scandalous figure, flat, like a flattened, Japanese-style image of figures, dark silhouettes in dull yellow glow of electric light - it was a new Paris, Paris, Toulouse-Lautrec. 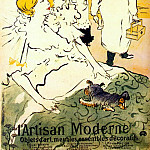 With a poster artist made color lithography and multiplied. 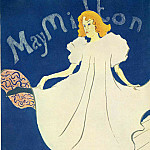 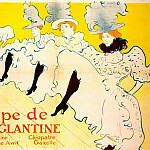 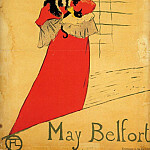 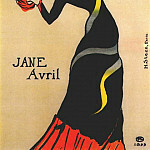 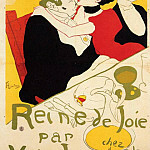 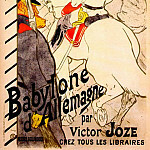 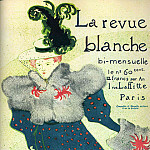 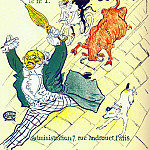 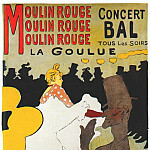 At the end of 1891 it appeared on the walls of Paris of 3000 copies of the posters of "Moulin Rouge". 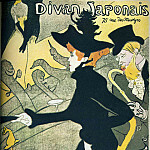 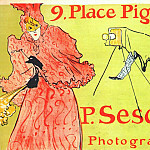 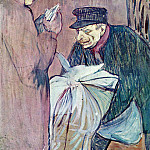 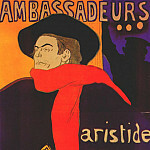 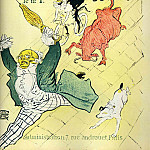 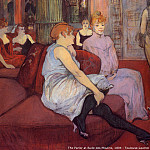 Posters Lautrec enjoyed such success with the Parisians, that there was a kind of thieves who were watching, when the sheet is adhered to the wall or cabinet, and then tore off her barely sticker left. 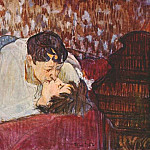 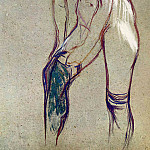 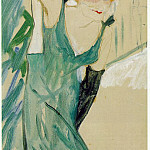 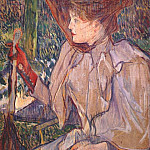 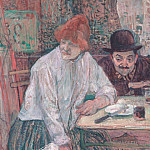 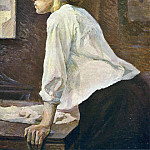 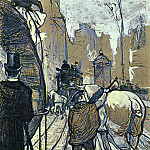 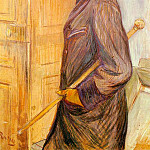 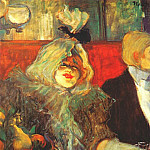 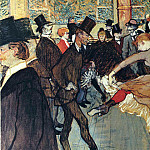 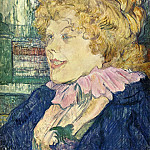 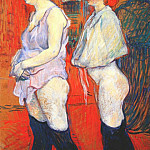 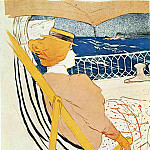 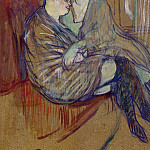 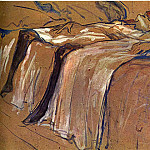 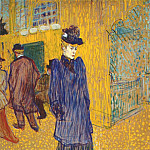 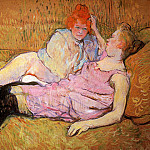 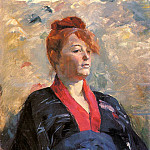 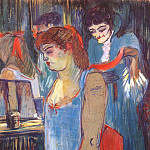 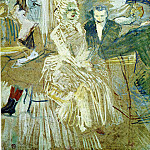 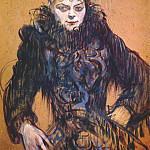 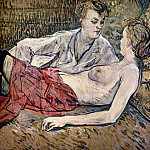 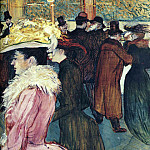 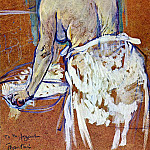 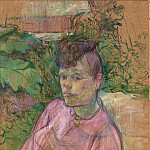 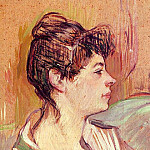 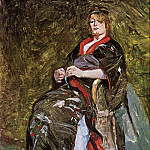 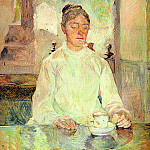 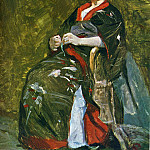 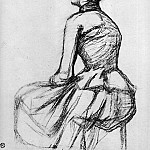 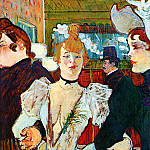 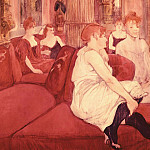 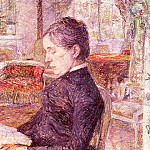 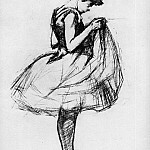 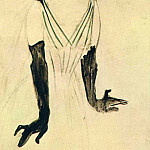 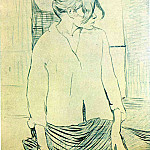 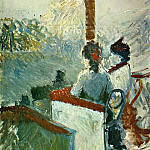 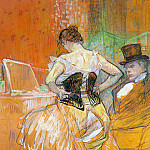 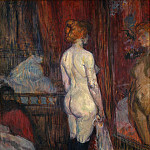 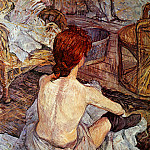 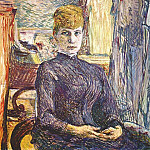 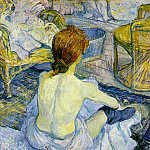 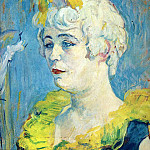 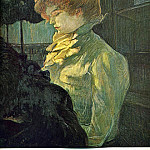 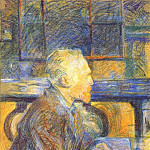 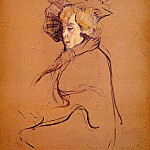 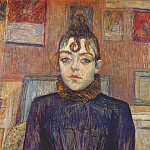 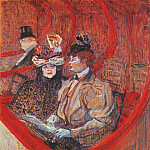 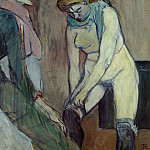 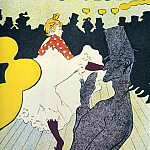 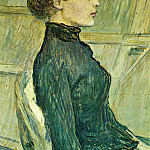 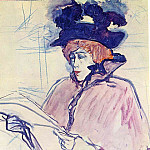 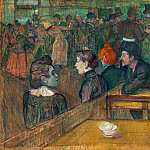 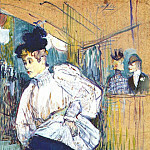 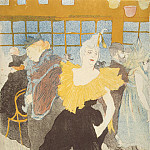 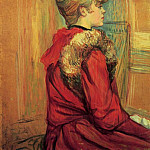 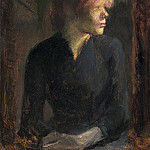 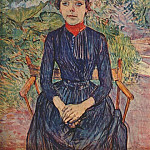 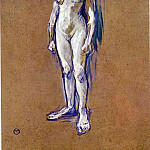 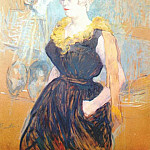 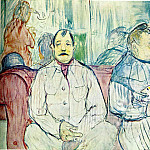 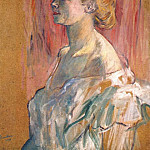 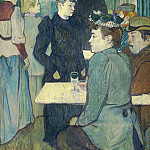 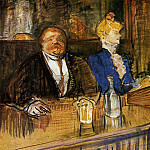 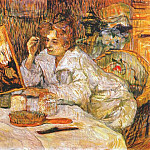 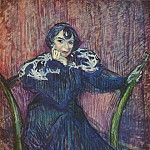 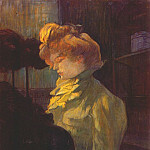 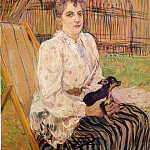 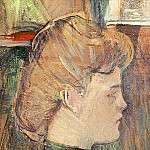 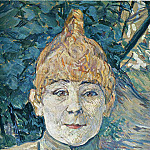 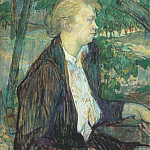 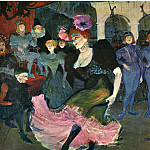 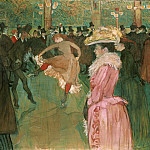 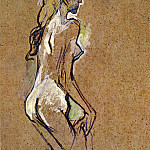 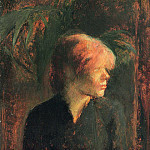 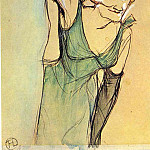 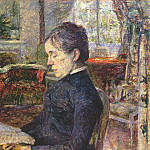 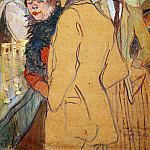 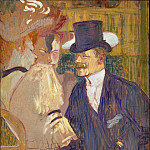 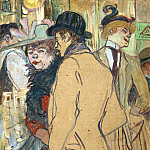 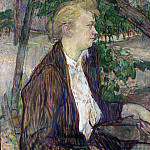 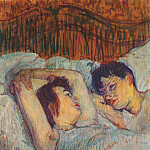 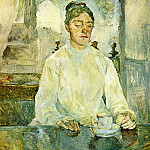 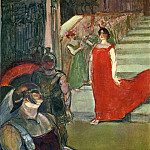 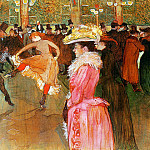 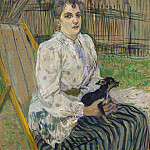 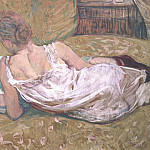 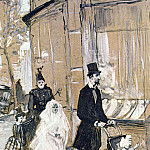 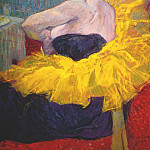 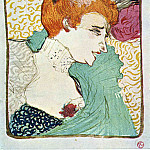 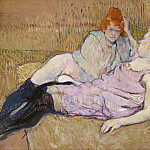 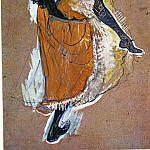 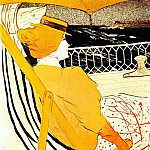 In the late 1890s Lautrec exhibited his work in various European countries, as well as in Britain and the US. 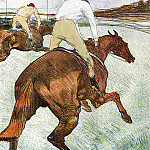 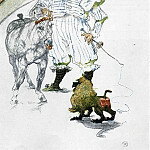 He painted, made lithographs, collaborated with the magazines. 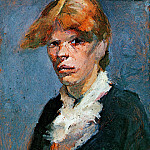 But fame has not changed his personal life. 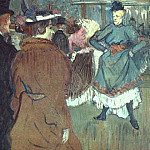 As before, he felt free only among inmates Montmartre dancers and prostitutes. 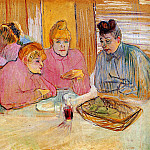 These women were his nudes and his friends. 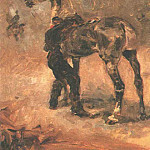 Only with them it felt like a complete human being, and he dealt with them as equals. 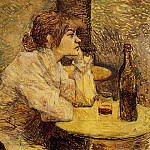 It is the same as they are - an outcast, and the sufferer, who was forced to laugh in the face of fate and grief pour alcohol. 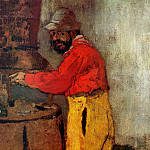 But he, like them, working hard. 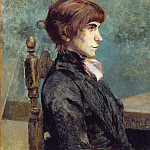 His father, blaming his life, partially stripped Henri inheritance uncle burned several of his paintings, and only his "poor Holy Mother" (as he called her in front of friends) loved and accepted his son's genius and ugly as it was. 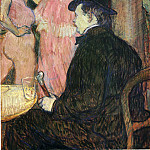 Drunkenness, brothels, work - his life was like a kaleidoscope. 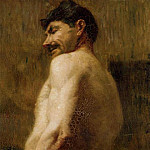 He begins to suffer from paranoia, infected with syphilis from one of the nudes, his hallucinations torment ... Once friends, heard the shots from his bedroom, he ran and saw that he was shot from an imaginary invasion of spiders. 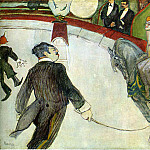 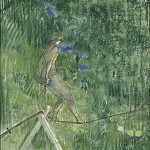 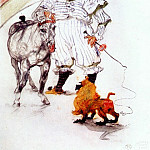 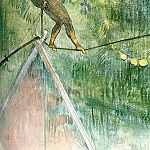 Like his close friend of Van Gogh, Henri was locked up in a mental hospital, but there continued to work, for example, memory painted a series of paintings of the circus, to prove that he is healthy. 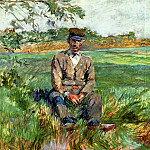 After 2 and 5 months, he was released, but he relapsed into alcoholism. 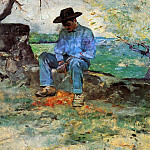 The last few days he had met in the garden of his mother, continuing her painting. 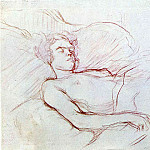 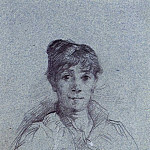 Henry died in her arms from paralysis in 1901, just before his 37th birthday. 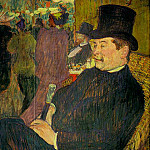 Even when he lived in Montmartre, Henri sad joke on its growth, stating that he is close but fall when drunk. 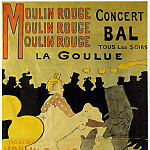 Movies: "Moulin Rouge", 1952, dir. 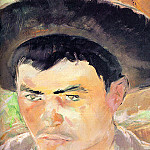 John Huston; 2001, dir. 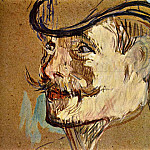 Baz Luhrmann. 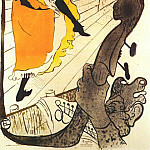 Alias Treklo Lautrec He signed his paintings a few years at the request of relatives, "not to disgrace the" Count's race. 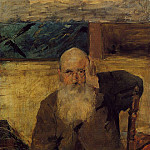 Disciples in the Atelier Cormon in different years were: Roerich and Borisov-Musatov, Chaim Soutine and David Burliuk and others. 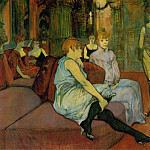 Picasso admired the works of Lautrec, and after the death of the artist turns to the same nudes (dancers, singers, courtesans), ask them to talk about their friend Lautrec, and in his works - to the same topic (brothels, theater, circus). 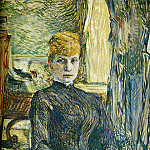 With Lautrec Vincent Van Gogh she met when they studied at Atelier Cormon. 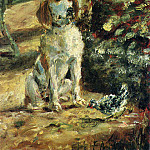 They were friends for life.